In the UK alcohol abuse became a cause for concern so some years ago a consortium made up of some of the largest drinks manufacturers and producers was created to help advise on and monitor safe drinking. 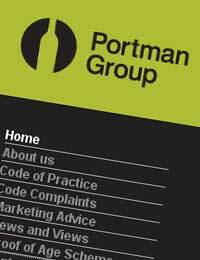 The Portman Group was established in 1989 with the purpose of promoting sensible drinking, helping to prevent alcohol misuse and abuse, and to help generate a better understanding of alcohol-related issues. The name came from the early meetings to launch the organisation, which took place at the Guinness offices in Portman Square, London. The Group’s members are all big brand names you will recognise, and the importance of the group is paramount in helping to promote and maintain high levels of responsibility within the industry. Answering a need for a watchdog in 1996, the Portman Group took on the role of encouraging responsible marketing, launching a Code of Practice on the Naming, Packaging and Merchandising of Alcoholic Drinks, largely in answer to the criticism surrounding the launch and marketing of 'alcopops'. This Code has now been expanded to cover other forms of advertising, promotion, websites, sponsorship and branded merchandise and is generally credited with improving marketing responsibility throughout the industry. In 2004, the Portman Group set up the Drinkaware website to offer comprehensive advice on responsible drinking, including a website for the public to view. It’s now a familiar brand and guideline for both industry and consumers alike, offering support and advice on packaging, advertising and safe drinking behaviour. This is becoming more and more relevant as alcohol abuse and alcoholism are still on the rise in the UK. Since the end of 2006 the Portman Group has transferred all the educational campaigns the group had set up to raise consumers’ awareness over to new charity The Drinkaware Trust. The educational campaigns were created to offer consumers advice on sensible drinking and the dangers of alcohol abuse and misuse, and the Drinkaware Trust have been able to promote these in a ground breaking enterprise to help combat alcohol problems. Obvious examples of this campaign include the drink/drive advertisements on the television, the Christmas drinking ads, billboards, all warning messages and all packaging on alcohol itself, particularly the scourge of the alcohol misuse scene, the alcopop. Focusing the campaigns in this way has meant that the Portman Group can once again concentrate on raising and maintaining high levels and standards of responsibility within the industry. They are able to independently handle complaints from the public about concerns over alcohol packaging or marketing, and the Group offers a free advisory service, based on its knowledge and Code of Practice, to advise on whether the potential promotion or marketing of a new product is likely to be acceptable. It’s advice that can save a company a lot of time and money in the long run! The Portman Group also pioneered proof of age cards as useful ID for young people – please note they now no longer are able to supply these as there are so many other schemes around. But if you have any queries relating to alcohol packaging or marketing, you can easily find both the Portman Group and Drinkaware online, where you will be able to file a complaint. @Miriam. It happened to me too a few years ago in another well known supermarket when my children were younger. I have recently been in accompanied by my 17 and 19 year olds and bought a bottle of prosecco without question! Clearly different times, different check-out staff, different rules.